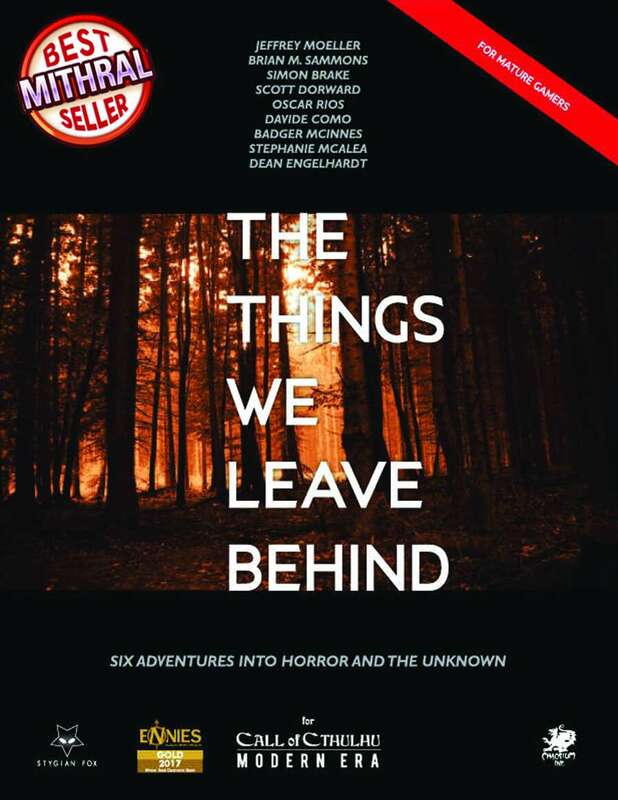 The Things We Leave Behind is an ENnie award winning anthology of 6 modern day scenarios for the Call of Cthulhu roleplaying game published by Chaosium, Inc, edited by Jeff Moeller, and written by Brian M. Sammons, Scott Dorward, Simon Brake, Oscar Rios, and Jeff Moeller with art by Davide Como, Badger McInnes, Dean Engelhardt, and Stephanie McAlea. As a thank you to all those who voted for us we're knocking $5 off the cover price for the next week! Taking its inspirational cues from Delta Green, Fargo, Blood Simple, and True Detective, the book takes a mature look at the horror of human nature and its ability to be just as disturbing as anything from the Mythos. The scenarios deal with unavoidable fates, dark secrets, and seriously bad choices made by the antagonists. As so often is the case, there are no winners when fate has trapped you in a dice game for doom or destiny. As such, please be aware that some of the themes are quite mature and are suitable for adult gamers only. Dispo aussi sur cette chaine, Roots/Racines. Pour info : je conseil pour Roots de faire jouer des membres de la famille de Karen, oncle, cousine, etc... A ma table, il y avait un oncle, une tante, une cousine, Joe le père est devenu un pj et il y avait la petite amie de Karen. Tout lemonde s'est senti hyper impliqué, un régal. Small Errata note - In Ladybug - There is a security guard in the opening scene that seems to disappear after first being mentioned. (Trying to keep it spoiler free) I will likely replace the greeter with the guard in my run. -- is the game system CoC 6th or 7th edition ? -- are modern era pregenerated characters provided ? -- 7th ed., but there are a few places in Ladybug, Ladybug (the only one I've run so far) where they fall into 6th ed. mechanics, e.g. subtracting a fixed percentage from skills instead of increasing the difficulty (or adding penalty dice). That's probably because 7th ed. was fairly new when it was written, and it takes a while to digest all of the subtleties of the rule changes. I am curious if these are interlinked scenarios, separate ones, or if they have a sorta framing device like with Trail of Cthulhu's final revelations? Hi, the book does have an overarching campaign frame but it was only available to backers of the Kickstarter and only as a separate PDF. There are currently no plans to release that to the wider public. My apologies. That's fair enough, I guess the kickstarters need something unique! Is it possible to get hard copy or print on demand. I don't particularly like running scenarios from pdf. We are waiting on proofs from Lightning Source. We anticipate hard copies will be available in 2-3 weeks. The Print version is now available. So I can open in Chrome but not with Preview on Mac OSX like I can most PDFs. Any ideas? The only time I've had pdfs not open in preview were those forms that required adobe reader, but this shouldn't be that case plus you were able to open it in chrome. If the print preview thing works well enough, there are programs that let you make a table of contents and save it to the PDF. They usually are $5-10 though. Not the best solution, but hopefully that helps somewhat. Hi, will there be a POD option, please? In a few weeks. Physical book proofs have to be ordered up and carefully reviewed, since once those go out, any minor errors are written in stone. They also have to be approved by the licensor (Chaosium), so they are always available a few weeks after the pdf. If we had already purchased the pdf, is there some sort of voucher to get a discount on the print version? If so, how do we go about getting that? Hi Frank, simply send the email proof of purchase to stephaniemcalea@outlook.com and I'll arrange for you to get a physical copy for a discount cover price (minus the PDF cover price, basically). Are these scenarios playable with one player-one keeper, or are they intended to be played strictly with a full party? The first one (Ladybug, Ladybug) you might get away with playing with a single player.. the others are likely to be seriously lethal for a 'Lone Gunman'. A friend of mine ran Hell in Texas with a single player. Apparently it worked perfectly. Ladybug, Hell in Texas and The Night Season, yes. Roots and Forget Me Not, no. Intimate Encounters, with a very skilled and experienced/non combat oriented player. Roots has parallels with a few films that pit a lone protagonist against an isolated community. Those protagonists did not survive. However, if that's the sort of story you want to explore there's no reason you can't - the hook relies on a personal connection to one of the PCs, with the scenario designed to be especially horrific for that one person as a result. IF we buy this now will we get a discount when the PoD comes out - or should we just wait? Will DriveThruRPG notify us when print becomes available, or should we just keep checking back? BTW, love Ladybug. It's running very well, though not the way I expected it to. Hi Randy, the print on demand version is now available. Do I need to request this voucher (I purchased the PDF but have not received any emails about upgrading and ordering the PoD)? I ordered it. Thanks. BTW, I really like running LadyBug. This title was added to our catalog on August 21, 2016.